Carroll Gardens, which has been a largely Italian neighborhood, is an extremely popular place to live because of its tree-lined streets, its mom-and-pop stores and its overall peaceful and historic atmosphere. While it's changed over the years to become a fairly expensive place to live, it still remains one of the nicest places to visit and has a lot to do, including shopping at boutiques, enjoying its sweet shops and taking advantage of its bars and game shops. So to help you plan a day there, we've gathered some of the best places to eat, shop and hang out in this lovely neighborhood. When you arrive in Carroll Gardens, your first thought should be pecan pie bourbon French toast from Buttermilk Channel, located at 524 Court St. The restaurant, a known favorite of Beyoncé, feels like you've stepped into the best of Brooklyn: exposed brick walls, Bloody Marys and cheddar waffles. But the star of the menu, in our humble sugar-loving opinion, is that drenched, syrupy French toast. After breakfast, take a walk through the neighborhood and work off the decadent brunch. Stroll down Clinton Street and take in the beautiful historic brownstones and tree-lined sidewalks. Zigzag through the side streets that give the neighborhood its charm, and finally make your way to Henry Street. Next walk up to Smith Street and pop in and out of local shops. 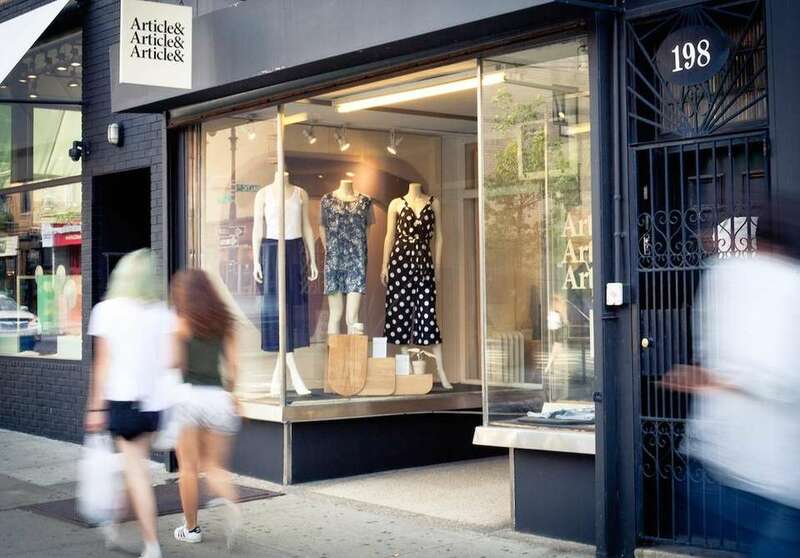 Start at Article& at 198 Smith St. where you'll find a nice selection of reasonably priced clothing. Or hit up Bird at 220 Smith St., where you'll find pricier, but unique designs. Pop into Stinky Bklyn at 215 Smith St. and browse the excellent selection of jams, oils, chocolates and, of course, cheese. If you're still hungry try one of the specialty sandwiches in the back of the shop, and don't forget to pick up some of the locally sourced baked goods in the front. If you need a pick-me-up after all that exploring, head to Brooklyn Farmacy & Soda Fountain at 513 Henry St. for some ice cream or a snack. While the grilled cheese and classic egg creams are delicious, it's the enormous sundaes that keep people coming back. We recommend the Mr. Potato Head, which features locally made vanilla ice cream, homemade peanut butter, potato chips, caramel and whipped cream.This is also available in half size, which is full size for most normal humans. The building itself is steeped in history, first opened as an apothecary in the 1920s that stayed open for decades. It eventually shut its doors until the current owners bought and renovated the space, restoring many original details like the tin ceilings and tile floors to their former glory in the process. Now, the soda "jerks," as they're called, serve up delicious ice cream and sandwiches that make you feel like you stepped right into the 1950s. "The taste is always the same so people always come back for it," says Josephine Messina, who runs Mazzola with her brothers, Frank and Anthony Caravello. Coffee, cookies and breakfast items (bagels, muffins and croissants) can be found at Mazzola, as well. Make your way down to Carroll Park where you can sit for a while on one of the benches and rest after all that food and shopping. The park itself was originally planned as a private garden in the late 1840s, according to the city. It was named for Charles Carroll, one of the signers of the Declaration of Independence. Lucali, at 575 Henry St., is another pizza spot that has been so thoroughly hyped, is so critically acclaimed and well-loved, that it's hard to imagine the food will live up to it. But the laid-back, comfortable, dimly lit pizzeria run by Carroll Gardens native Mark Iacono doesn't disappoint. There's no paper menu: just pies, calzones and toppings. The pizzas, sprinkled with fresh basil and garlic (other toppings are extra), are extraordinary. So are the calzones, but that's another list for another day. Yes, you'll wait -- so plan on toting around a bottle of wine or two (it's BYOB), spending an hour or more at a nearby bar while you await your call from the hostess with the wonderful news that it'll be your turn to enjoy a pretty perfect pizza. There are seemingly endless options for restaurants in the neighborhood, but for an old-school taste of Carroll Gardens, head to Vinny's of Carroll Gardens at 295 Smith St., which opened in 1997, for an authentically Brooklyn Italian experience where they don't skimp on ingredients or portions. Try the penne with broccoli rabe. In the mood for something different? Head to Zaytoons at 283 Smith St. for Lebanese food. Order the Zaytoons combo plate and make sure you get their hummus and Turkish salad with it. Don't leave without trying the za'atar bread, the absolute best in the city. The chicken shawarma sandwich and their pitzas (pizza on from-scratch pita bread) are favorites. Smith Street Stage puts on free or low-cost performances each summer -- when they play Carroll Park, it's free, otherwise it's $25 - $55 depending on the seat. This summer, the company is doing Shakespeare's "A Midsummer's Night Dream" between June 20 and July 15 at 2 and 7:30 p.m. The schedule is here. This board game cafe and social club at 333 Court St. has more than 500 games you can play. For about $10, you can rent a table and play any game of your choosing, from Settlers of Catan to Ticket to Ride and more. There's no limit, except for time. There are also scheduled events, leagues and tournaments you can join in on, too. It's a fun way to end your night and isn't far from neighboring bars if you want to wrap up your visit to Carroll Gardens with a drink. To cap off your day in Carroll Gardens, go to Zombie Hut at 273 Smith St., where the tiki-themed drinks flow and there are board games galore to entertain. Sip on giant, shared drinks with multicolored straws as little plastic monkeys hang on the glasses. Try the Frozen Zombie (pictured), a delicious slushy mix of alcohol that will quickly creep up on you.